Over time, AU evolved into a useful venue for news and the pulse of what was happening in areas not reported by the Ann Arbor News. There were some really nasty anonymous commenters and some annoying threads that ultimately required moderation (to anguished cries of Censorship! ), but also some really good conversation about the topics of the day. Julie Weatherbee also performed a considerable service in posting a summary of items that were coming up on the council agenda, with appropriate links. But now it’ll come off my list of local media. I’ll miss it. AU was also a point of entry to discover other blogs. As we’ve noted before, this expanding universe (blogosphere? whatever) of local blogs is a great way to learn about topics of special local interest. But now we are seeing its impermanence also. Indeed, most of the blogs listed on AU’s masthead are either gone or inactive. Along with AAIO, this includes Larry Kestenbaum’s “Polygon, the Dancing Bear“, once a good place for political commentary but apparently an awkward fit with being the county clerk; Murph’s own Common Monkeyflower (perhaps not a good fit with being a working urban planner) and Teeter Talk (still some intermittent articles, but Homeless Dave has found a home on the Ann Arbor Chronicle). Edward Vielmetti still maintains his venerable blog, which I still think of as Vacuum though it is not named that, but I suspect that his new role as blogmeister at AnnArbor.com has been a considerable distraction. To some extent, the newsiness and immediacy of local blogs, not to mention the sometimes snarky commentary, have been usurped by “legitimate” online news media, like Ann Arbor Chronicle and AnnArbor.com. AnnArbor.com even solicits volunteer contributors who are essentially bloggers. But there are still some local blogs of interest. One that everyone is talking about today (well, everyone who is interested in local politics) is A2Politico. The latest post announces that its previously anonymous author, Patricia Lesko, is running for mayor. I’m curious to see whether she will be able to keep up the prodigious output of the last several months. Another political blog is Some Other Viewpoint, unusual for this area in that it discusses Washtenaw County issues from a relatively conservative (and overtly Republican) viewpoint. A group I’m involved with has a blog, Public Land – Public Process. There are also two Ypsilanti blogs that are worth following. Advance Ypsilanti is all about that city’s policies and politics. Mark Maynard writes about many topics, often but not always local (including a recent story about the next step in Murph’s career), and usually provocative and/or entertaining. Who knows how many of those blogs (or this one) will be around in another year? The problem with blogging was explained to the Pope on a recent radio show: “You have to keep posting”. AU had a longer run than most, perhaps because of its group nature. So farewell, Arbor Update. It’s been good ta know ya. UPDATE: After receiving the comment from Edward Vielmetti about the New West Side organization, I went hunting for the article I wrote about the Arbor Update bloggers back in 2005. (I had to scan the paper copy: the Ann Arbor Observer doesn’t make digital copies generally available.) Sure enough, it quotes Dale Winling on his efforts to establish alternative renter-based neighborhood groups and the core of AU bloggers as being against having “homeowner values” pushed on them. 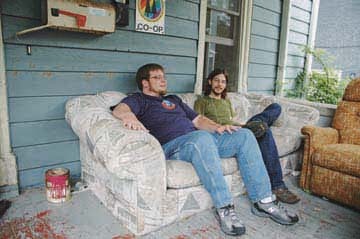 The Observer chose a picture from 2004, showing two of them enjoying their victory over the proposed ordinance that would have kept couches off porches, a source of visual blight to homeowners but a basic freedom to student renters. SECOND UPDATE: It was with high hopes that I clicked on a new blog highlighted by Ryan Stanton on Twitter. But the anonymous blogger (self-identified as female) of “arborblahg” seems more engaged by animus against everyone not her own generation than any political sensibility. Not very subtle or even very funny: “geritol spiked with vodka and viagra”. An email we received at our blog email address from “Mallory Weis” inviting us to look at the new blog says her motivation is “because I need something more meaningful than ‘House’ and ‘Grey’s Anatomy’ in my life”. I deduce that she is fascinated by medicine from these hints and because “Mallory-Weiss syndrome” is described by Wikipedia as a condition of bleeding from tears at the junction of the stomach and esophagus caused by retching and vomiting “often associated with alcoholism and eating disorders”. Pretty. She needs a proofreader too. No need to look for serious examination of the issues there. Arbor Update, I miss you even more. UPDATE: The use of upholstered couches on porches was outlawed by the Ann Arbor City Council on September 20, 2010. The story on AnnArbor.com continues to receive angry comments from students. This entry was posted on February 3, 2010 at 9:31 am and is filed under media. You can subscribe via RSS 2.0 feed to this post's comments. You can comment below, or link to this permanent URL from your own site. I love reading local blogs, because it allows me to get to know people and exposes me to different views that I might otherwise ignore. But I think you are right in that “legitimate” news blogs are usurping the “amateur” ones…it will be interesting to see what happens. And you did your bit as one of the AU regulars! Thanks, Patti. Vivienne – thanks for the link. I wouldn’t characterize the New West Side Association as “anti-neighborhood”. That collective was part of the group that was at Madison House, which put on Madison Fest which turned into Ypsilanti’s Mitten Fest (planning year 5 of that for this coming December). I saw that as part of the student perspective that says “we don’t own this place but we live here too”. It’s hard to sustain that perspective beyond a few years of grad school since at some point you age out of the demographic that you represent. At some point you stop being students and start being alumni, sometimes alumni who live elsewhere but still have a stake in the place. Yes, that is a fair comment. I thought their collective was a fine thing and applaud their creativity. But there was a very hostile tone that came out of there sometimes. I did read the site and many of Dale’s pronouncements. The young deserve some tolerance and I try to give it, but would sometimes appreciate a reasonable return of the favor. I was embarrassed, though, when I did an article for the Observer on Arbor Update and they chose for the illustration a much younger (then) picture of Murph – and was that Dale? sitting on a porch couch (one of the early crusades), looking much scruffier than their current evolving personas. Thanks for the update and pdf file of your Observer article. Just 5 years after the announcement of the New West Side Association (NWSA) and this “movement” is folding its tent and moving on. The NWSA, the Ann Arbor Alliance, Ann Arbor is Overrated and ArborUpdate embodied that youthful smugness that looks down its nose at taxpaying, home-owning, breeders like me. The ArborWiki entry for the Ann Arbor Alliance quotes the group’s intention to “use our significant numbers in this community to assert our power and set our own agenda for Ann Arbor.” Instead, they are leaving those unaccomplished goals behind like an abandoned porch couch. Perhaps, in time, their children will come to Ann Arbor to learn at the UM. Maybe they will gather in the town square atop the library lot parking structure to protest the unresponsiveness of local governments to students’ desire for immediate gratification. We “anti-development” townies hope to make sure that the town square is there for them when they pass through on the way to real life. The on-line conversation in blogs and local news sites is shifting from the utopian “new urbanist” dreams of the transient elite to the real stakeholders in the community. The tone and content of the conversations on emerging blogs is so much more content-driven and so much less shout-down-the-opposition. Will reason prevail in the long-run? Time will tell. Breeders? I think you are more of a protector, Jack. (Reference to the science fiction works of Larry Niven.) What I have observed in recent years is a shift to more of a concern about walkable, accessible mixed-use development as a slightly older and more established group takes up the cause of urban density as a contrast to what they often refer to as the “suburban” structure of many of our neighborhoods. The earlier group seemed to confuse their immediate studentish needs for freedom of behavior and easy parking with the grander goals of urban planning. What is emerging now is a debate that we should have in Ann Arbor, about what the future structure of the city will be and about whom it will serve. The current debate about the Library Lot is one facet of that. What the current crop of students seem to want is high-rises with full amenities. When I was interviewed by the Michigan Daily board (who ultimately endorsed my opponent), they seemed to want support for the 601 Forest building, for example. When I answered one question about concentration of student housing with the response that I didn’t believe in student ghettos, that was clearly the wrong answer. But I wonder how many students could really afford to live in the new developments. Maybe the UM is becoming an institution that caters only to the children of the rich. By “breeders”, I only mean that we have had children. Niven’s protectors seem inapplicable to a NIMBY scoundrel such as myself, but I take your reference as a complement. I find it amusing that some of the porch-couch-as-a-fundamental-right crowd went on to champion the new urban high rise ideal. I wonder whether 4/11 Lofts (or other density based developments)allow old beat up couches on the balconies. Jack – if your comments here are an example of the “content-driven” format that stands in contrast to “looks down its nose youthful smugness on its way to real life”, then, wow, we must have *really* been bad. As Ed notes, “New West Side” was not (in my recollection) “anti-neighborhood”, per se, though perhaps Vivienne meant “anti-neighborhood association” in the sense of “anti-folk music” – less of a nihilist opposition and more of a variation on a theme. One of the ideas that Dale, I, and others fairly consistently championed – to varying outputs, as you note – was that any individual student may indeed leave town after a 4-6 year tenure, but that doesn’t mean that student is a non-person while they’re here, nor that their interests cease to exist the moment they graduate. That student, individually, and students as a category are real pieces of the Ann Arbor community, rather than simply some temporary thing to be endured. For my part, I’m twice-graduated, married, homeowner in a student-dominated neighborhood, etc., etc., and am still waiting for the hate to kick in. Any idea when I should expect it? I think Murph has you there, Jack. Maybe if you hadn’t lumped AU in with AAIO, or if you hadn’t insinuated that students aren’t “real stakeholders”, you might have noticed some common ground. Students, even if they weren’t real stakeholders while in school (I’d say they are, though some more than others), *become* stakeholders, somewhere. Many of them here, like me, in our city and our county and our state. They don’t leave those unaccomplished goals behind, they continue to work toward them. We could work with them, even (especially?) if we disagree with them. Steve, I disagree. He seems pretty sensitive to being called out for someone who participated in forming a blog named “Ann Arbor is Overrated”. The site name demonstrates condescension toward a whole town. I did not call all students smug, just those who were so condescending to our little town. AU seemed to pick up on that condescension by fostering a group think mentality that labeled anyone concerned about the quality of their city or neighborhood as a NIMBY. This town has a great history of student activism. UM students were active in both the civil rights movement and the anti-war movement. AAIO and the Ann Arbor Alliance pale in historic significance to other student movements. I actually am not anti-student. I came here as a student. I stayed because I like the town. Had I found it unacceptably “overrated”, I would have left. I wouldn’t have stayed and tried to change the town to my liking over the objections of people who already lived here. In the last election cycle, I helped on the campaign of a student who ran for City Council. I liked that he wanted to find common interests of students and long term residents. As I recall, my neighborhood gave him more votes than the student neighborhoods. The unaccomplished goal I was speaking of was the Ann Arbor Alliance’s goal of getting students active and elected. I’m a former college teacher and I enjoy the life, enthusiasm, and innovation that the entire student demographic brings to the rest of us. (A moment of thoughtful contemplation of everything Matt Hampel has done, please.) And I agree with Steve that there was perhaps some conflating of AAIO with AU, by me as well. But Murph, you really did get nasty with that remark about curbcuts. My friends in Burns Park are finally able to have their friends over for a visit now. Are you allowed to park in front of your own house? But to repeat, I think AU enriched us all by expanding and facilitating the discussion. Thanks again to those bumptious students who started it. I confess that I am going strictly from memory, but it was burned in. It was on AU, I’m pretty sure, not on your own blog. It was in the discussion of the Burns Park residential parking program. As I remember, your argument was that homeowners with driveway curb cuts were making use of the right-of-way to which they were not entitled, because the driveway made that section of the street inaccessible to others who might want to park there. It hit me strongly because I have a friend whose house was always completely blocked for street parking and sometimes she even had to get special permits from the city if she wanted to have a party, so that some parking could be kept available for guests. I have found that the AU search engine does not yield a good hit on comment searches. I have looked for other comments that I remembered people making them and failing to find them. I hope that I am not confusing you with someone else, but I don’t think so. I always found your comments to be the most subtle and complex and paid special attention to them. Well, now that I’ve looked at the quote from the Common Monkeyflower site, maybe that was it. You suggest charging $300K per driveway, right? As to “residential parking permit” issues, all I can say is that it strikes me as an opportunity for the city to make some money by offering non-resident permits for parking in those areas. You could charge at least what the U of Michigan charges for “yellow” permits – $150/yr or so looks like the going rate – and offer them up instead of putting parking meters into residential areas. There’s almost certainly some other residential streets where you could charge what the U charges for “gold” permits – $1500/yr – and get enough takers that the residents would not be dreadfully inconvenienced. The New West Side association was not anti-neighborhood, nor was it anti-neighborhood association. It was intended as a counterweight to the limited view of neighborhood interests advanced by the OWS association (in which I was a dues-paying member and tried to get involved). I loved living on the OWS. It’s too bad we can’t have more neighborhoods like that, but I think you know the zoning code and political climate pretty much rule that out. Reading about AU and AAIO makes me feel like we came a little late to the grad student blog game with Damn Arbor. No way! You are carrying on a proud tradition. Besides, your blog is more diverse and interesting than AAIO ever was. AU had a unique role at a time when little online commenting by the community was possible. That has been somewhat taken up by online media.